A protocol analyzer is a measuring instrument that analyzes one or more signals that are used to communicate between electronic devices according a specific protocol. A protocol analyzer examines the signals and decodes the information that is transferred. De decoded information can be displayed in graphs, meter sinks and table sinks. A protocol analyzer is a useful tool when developing a hardware and/or software implementation of a communication bus. It can also be used when debugging device or bus failures. The CAN analyzer in the Multi Channel oscilloscope software can be used to decode messages which are transmitted on a CAN bus. The source for the CAN analyzer can either be the differential CAN signal or the CAN-high signal. All CAN bus bitrates are supported. Various fields from the CAN bus messages are decoded and can be displayed in a table as shown below. Figure 1: Measurement on a CAN bus in a car, with data decoded by a CAN analyzer. 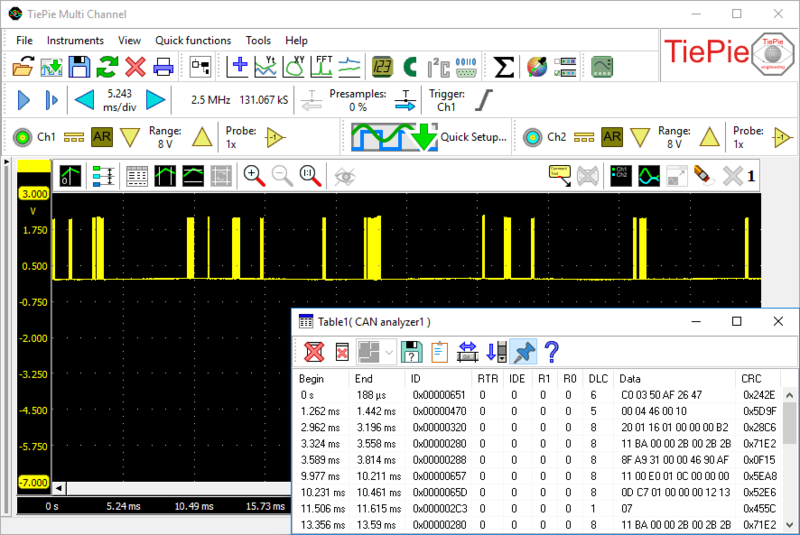 The J1939 decoder in the Multi Channel oscilloscope software extracts SAE J1939 SPN values from CAN messages. It has one input to receive CAN messages, from e.g. a CAN analyzer and can have multiple outputs. Each output contains the values of a single SPN (Suspect Parameter Number), selected from a database or loaded from a custom INI file. The data from these outputs can be used in graphs, meters, tables and by other I/Os. Figure 2: J1939 decoder showing decoded engine coolant and manifold temperatures. The I2C analyzer in the Multi Channel oscilloscope software analyzes both I2C signals and displays the transferred messages. Besides I2C busses, it also supports related buses like SMBus, ACCESS.bus and TWI. 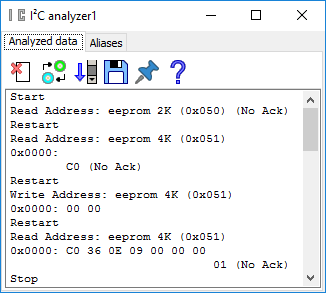 Figure 3: I2C analyzer displaying multiple decoded eeprom read and write operations. User defined alias per address for quick device recognition. 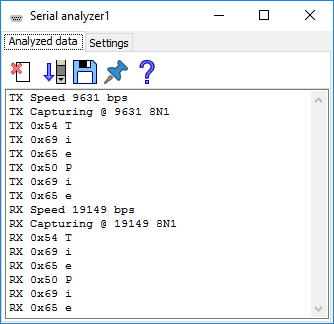 The Serial analyzer in the Multi Channel oscilloscope software analyzes one or more serial signals and displays the transferred messages. It supports RS232 serial interfaces, as well as related interfaces like RS485, MIDI, DMX and other compatible buses. Figure 4: Serial analyzer displaying decoded serial data 'TiePie' transmitted in two directions. Stopbits setting: 1 or 2. 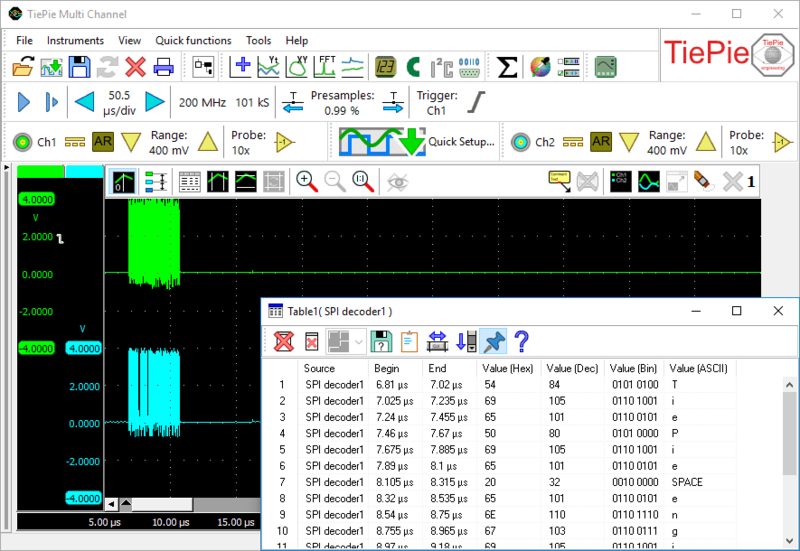 The SPI decoder in the Multi Channel oscilloscope software analyzes the Clock and Data signals on an SPI bus and displays the transferred messages. Figure 5: Measurement on an SPI bus, with data decoded by an SPI decoder.